Personally I learn a lot from reading/listening up on vision rehab and anatomy but I learn just as much from having conversations with other strabismics. I think it’s a practice that could be useful to anyone with any problem. Don’t compare yourself to people with a very differing, in this case neurological, background. Learn from people who are similar to you and dealing with similar day-to-day problems. What follows is a blog post constructed on this type of conversation. PASQUALE: Hi Michael, in many blog entries you mention jaw clenching. I too have said that I engage numerous facial muscles while I try converging and diverging at different targets. It feels like the brain is recruiting other muscles because it still hasn’t figured out how to properly use the eye’s extra-ocular muscles. MICHAEL: I always think of it like learning how to do something with your left arm (unless you are left-handed). First you use your entire arm, often in a contorted way. Then you move on to more specialized movements of the joints and ultimately you can do things smoothly having very fine control over your arm, hand and fingers. Theoretically the potential for improvement is limitless. Let’s transpose this to the visual realm. At first, when trying to accomplish a visual task, you are doing it very clumsily and inefficiently. Your brain is trying to accomplish a task which requires fine ocular motor skill but it’s not succeeding because of a lack of (lasting) control. Because many of us are hardheaded we redouble our effort and adjacent regions and resources like facial muscles are drawn into the process to little or no avail. Not good. Instead of redoubling our effort employing a very limited set of visual skills we should go back to the drawing board and improve and multiply our skills. Technique is more important than ‘brute’ force. 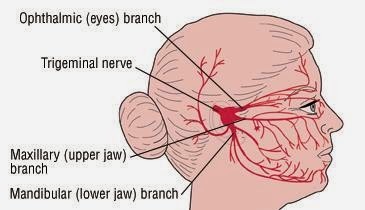 The visual system involves six of the the twelve cranial nerves. That’s a lot of guns to fire and potentially misfire. When I experience jaw clenching after too much reading or just a visually or otherwise stressful situation, that implies I’ve gone beyond my current visual skill level and I need to back down. PASQUALE: Have you figured out exercises that eliminate engaging other muscles except for those needed to coordinate the various components of the eyes. MICHAEL: Well, any activity that encourages ‘the eyes’, meaning the appropriate muscles and neural processes associated, to do the work without recruiting other muscles. That implies not going too far beyond your current skill level and paying a lot of attention without getting frustrated. For me it means slowing down and lowering expectations while gathering finer motor control. As long as my jaw doesn’t clench, I’m in the safe zone. Once I start hurting, I’m overdoing it. It’s not always easy to be patient and sometimes there are just visually stressful tasks I have to deal with. Then I’m tired, dizzy and in pain. When thinking about this problem I’m reminded of something I learned about earthquake resistent structures. There’s no such thing as a completely earthquake resistent building but you can improve a buildings capacity to withstand external shifts to a large extent. There are various approaches you can adhere to when going about the seismic retrofitting of a structure. The last option implies that various individual parts of the building can move or flex allowing for shock absorption. Vision Therapy is akin to a seismic retrofit for the visual system. You make structural changes in how it works and learn how to control and flex individual parts. You learn to lean into a quake rather than stiffening up. That way you can withstand more external demands, with reduced energy drainage and avoid collapse of the structure/system. For me, eye teaming remains a big challenge but I’m getting there. A related challenge is to gain more independent control over vergence and accommodation, i.e. taking on any binocular stance while manipulating my eye lens as I please. Either component should have limited effects on the other one’s performance and there should be a certain ease in doing this. Just like using individual fingers while playing the piano. An increased ‘isolation’ of these visual components gives more freedom of movement. To continue the piano anology, you’ll be able to play ‘visual Mozart’ instead of just hitting the keys indiscriminately with all fingers at once. As far as particular exercises are concerned, there are plenty of options to choose from if you understand the underlying principle. Magic eye stereograms, prism/spherical flippers, Eccentric Circles, Aperture rule, even just playing freely with your vision, … Many VT practices are grafted on this idea one way or another. They are looking to improve smooth eye teaming, lens focusing and then increasing skill level by adding more activities (balance, body coordination, cognitive skill, …). In that respect, I particularly liked a quote from the interview I did with Mark last month. It illustrates this point very nicely. MARK: I still have strabismus but I have a greater degree of control. The reduced suppression helps. I can line everything up that I need for stereopsis (fixation on an object, in focus, no suppression, awareness of peripheral vision etc.). It can be an enormous effort but it’s like any other form of learning. Repetition is the key and progress, however slow, will be made! The only catch 22 when talking about all this ‘control’ is that you won’t necessarily attain it by going about this like a control freak. Be relaxed, patient but determined. PASQUALE: It has taken me over eight months to finally feel that my brain can move my eyes with better coordination without trying to recruit a battery of other facial, non ocular muscles. I have gone through an entire slew of other muscles including those around the temple region, jaw, even moving my ears. The worse was when I actually felt my upper jaw putting tremendous stress on my entire skull as if trying to separate one from the other. I have to say that I see more positive progress now that my brain isn’t trying to move my eyes through the recruitment of all those other muscles.